Every year, Peers for Progress looks to the annual meeting of the Society of Behavioral Medicine as an opportunity to learn from experts, share research findings from our network, and get inspired to take action. The conference caters to a wide range of interests, and yet attendees could spend the entire conference focusing on a narrow topic area. For example, I was particularly excited to see the number of presentations on technology-enhanced peer support and health coaching. 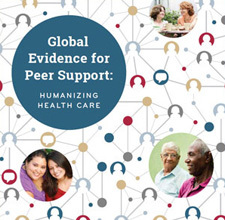 On our part, Peers for Progress investigators organized two symposia on peer support. The first symposium, Inside the Black Box: Deconstructing Social and Peer Support, took a deep dive into the mechanisms of effective interventions and offered practical recommendations to improve peer support programs. The second symposium, Peer Support: Channels of Dissemination, featured three model programs that have the potential to expand and sustain peer support for whole populations. In the past month, we’ve seen an increase in news coverage of Community Health Workers (CHWs) as they take on bigger roles in the US healthcare system. A feature in Modern Healthcare highlighted successful CHWs programs in Minnesota, New Mexico and Pennsylvania. Meanwhile, Florida became the latest state to establish certification for CHWs. On February 4th, the Institute of Medicine (IOM) released a discussion paper on CHWs. In this blog, we take a look at the benefits and implementation challenges outlined in this paper. The authors of the IOM paper cite that CHWs save costs for providers. For example, CHWs produced a return on investment of 4:1 when working with children with asthma and a return on investment of 3:1 for Medicaid enrollees with unmet long-term care needs.